On Monday, the Pentagon announced that President Trump had signed an order instructing the United States military to provide small and medium arms directly to Syrian Kurds fighting against ISIL (ISIS, Daesh), provoking anger and alarm in Turkey. Turkish President Recep Tayyip Erdogan castigated the United States for siding with “terrorist organizations” against Ankara, and his spokesman called the move “unacceptable.” It is an alarming conclusion in a fellow NATO state and promises a stormy meeting between Erdogan and Trump later this month. The Turkish press, outraged, complained that “the American, Trump, couldn’t even wait six days” for his upcoming meeting with the Turkish president before rushing into the decision. Since 2015, Erdogan has been pursuing a renewed war on the ultra-leftist, separatist Kurdistan Workers’ Party (PKK) in his own country, where Kurds make up some 20 percent of the population. Turkey and the United States concur that the PKK is a terrorist organization, but differ over the Syrian-Kurdish People’s Protection Units (YPG). The American government sees it as a secular-minded and valued ally in the fight against ISIL. Erdogan perceives the YPG as a wholly owned subsidiary of the PKK, and hence the Pentagon as a material supporter of terrorism. The area of northeastern Syria where the YPG operates directly borders Turkey. Ankara roiled relations with Washington in late April when it bombed Syrian Kurdish fighters allied with the United States. American military personnel embedded with the Kurds infuriated Ankara by attending the funerals of those killed by Turkish pilots. With regard to Washington doubling down on its Kurdish alliance, Redur Xelil, a spokesman for the YPG, said, “We believe that from now on and after this historic decision, [the YPG] will play a stronger, more influential and more decisive role in combating terrorism at a fast pace.” The reputation of the YPG was bolstered by its decisive victory this week over ISIL at the town of Tabqa and its nearby dam (the largest in the country), which further cuts the Sunni extremist group off from the outside world. Mehmet Tezkan stated the issue clearly in the centrist Milliyet newspaper: “This is the problem: Ankara is failing to convince the Americans that the YPG is ensconced within the PKK and that the heavy weapons supplied to them will reach the PKK” for use against the Turkish army and police. American military commanders insist that the weapons will be carefully monitored, and the YPG in any case, denies that it is linked to the PKK. More broadly, Turkey just does not want the Kurds to succeed in their quest for a federal ethnic province in Syria, where they form some 10 percent of the population, lest it give the Turkish Kurds ideas. A wrinkle in the story is that Erdogan butted heads this week over the Syrian Kurds with Vladimir Putin at a summit in Sochi, as well. Erdogan is said to have shown Putin a photograph of Russian troops standing guard with YPG fighters in the western-most Kurdish canton, Afrin. Putin said he would look into the matter. Russia is allied with the Baath regime of Syrian president Bashar al-Assad in an effort to crush the Sunni radicals of the Syrian Conquest Front (SCF) in Syria’s northwest, which has been linked to Al Qaeda (it was formerly the Nusra Front). The Kurds of Afrin are also locked in a struggle with the Sunni Arab fundamentalists and so have a tacit alliance with Assad (though they are at odds with Damascus in some ways because of their demand for a decentralized, federal Syria). Putin apparently told Erdogan that he does not view the YPG as terrorists, and does not even see the PKK in that light. Turkey is backing rebels in northwest Syria, some of them covertly allied with the SCF, and tried to protect them from Russia in November of 2015 by shooting down a Russian fighter jet. Turkey backed off its confrontation with Russia because of severe economic pressure from Putin, and Erdogan announced at Sochi that relations have been entirely restored. This statement is perhaps overly optimistic, at least on the Syria front. Putin apparently told Erdogan that he does not view the YPG as terrorists, and does not even see the PKK in that light. Erdogan at Sochi was said to look worried, and if Putin spoke as reported, it is hard to see it as anything other than a threat. As for the United States, the specific problem that Trump and Secretary of Defense James Mattis sought to address with the new order is that ISIL fighters drive into the middle of advancing enemy troops in Toyota trucks bearing improvised explosive devices, which they detonate to devastating effect. They up-armor the vehicles with steel plating so that small arms cannot stop them. or they use US-made armored vehicles looted in 2014-15 from the storehouses of the then-defeated Iraqi army at Mosul. It is being speculated that to meet this threat, Washington may provide US TOW or AT-4 anti-tank weapons to the Kurdish fighters. 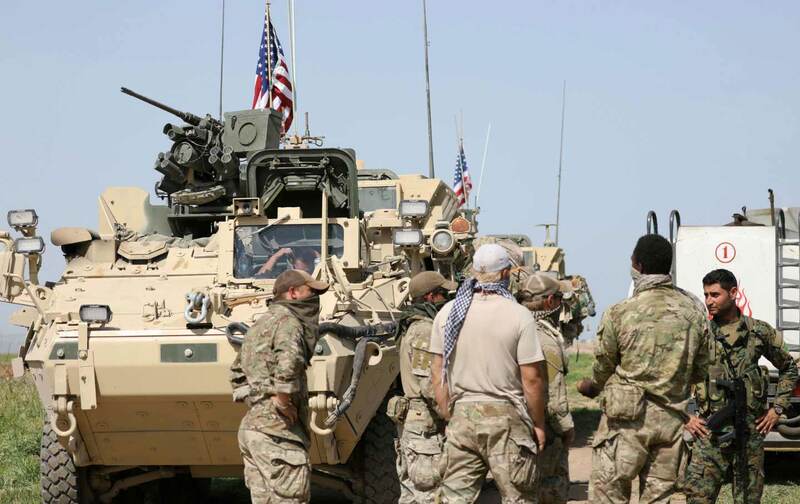 The YPG is part of a coalition with Arab clans of northeastern Syria, the Syrian Democratic Forces (SDF), which has for years been backed by the US military, and with which some 500 US Special Forces troops have been embedded. The SDF appears to be largely a fig leaf for the leftist Kurdish fighters, however—a public relations effort to mollify both Ankara and the Sunni Arabs of Raqqa who fear US-backed Kurdish dominance once ISIL is defeated. The United States was already arming the SDF to some extent. Trump’s decision to send heavier weapons directly to the YPG suggests that he is uninterested in the public relations effort. Apparently, in this regard, he is again on the same page with Putin.